Guest rooms feature contemporary decor with stylish furnishings including the Hyatt Grand beds, state-of-the-art media and work center with a high-definition 42 inch flat panel television that easily integrates with laptops, a comfortable cozy corner L-shaped sofa-sleeper, wet/dry bar and bathroom vanity with granite counter tops. Enjoy complimentary wireless high-speed internet and Complimentary a.m. Kitchen Skillet, featuring freshly prepared breakfast sandwiches, waffles, French toast, pancakes and steel cut oatmeal, available daily.24-hour Grab & Go food outlet offers hot breakfast, made-to-order fare. There is a special cancel policy at this hotel. For the months of April, May, October and November the cancel policy is 24hrs during weekdays ( Sunday - Thursday) The cancel policy is 72hrs on the weekends through these months ( Friday - Saturday). For the months of December, January, February, March the cancel policy is always 24hrs. Lastly for the months of June, July, August, and September the cancel policy is 72hr prior to arrival. Located on the tip of the Peconic River at the gateway to the North and South Forks of Eastern Long Island, the Resort and Conference Center features spectacular water and marina views. This ideal East End location in the downtown Riverhead business district affords the Atlantis Marine World Resort & Conference Center numerous competitive advantages, including a close proximity to large regional companies and the county government seat. Additionally, this site is perfect for the hub and spoke leisure tourism to a myriad of East End attractions, including not only the world renowned Atlantis Marine World, but also the Long Island Wine Region, Tanger Outlet Mall, the LI Railroad Museum, the Riverhead Raceway, the Hamptons beaches and towns, and a variety of beaches and outdoor activities, such as golfing, canoeing, and kayaking. 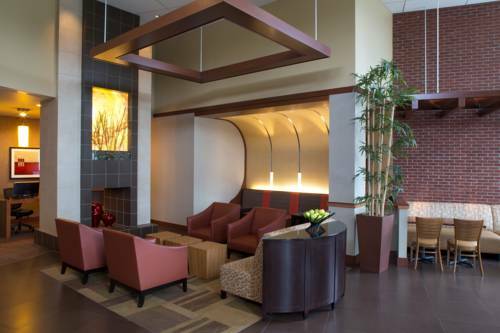 The Hyatt Place Long Island East End is comprised of 100 guest rooms and suites which includes indoor and outdoor swimming pools, state of the art fitness center, intimate coffee and wine cafe, business center and 120 slip transient marina. The Conference Center and Long Island Exhibit Hall, located between the Hyatt Place hotel and Atlantis Marine World Aquarium, features 29,000 square feet of flexible meeting and banquet space and a changing exhibition gallery two stories high with more the 5,000 square feet of exhibit space. With direct access to the Hyatt Place East End, Atlantis Marine World is on of America's premier family friendly destinations ranked 7th in the country by Parent Magazine as being one of the most interactive aquariums in the United States. Additional food and beverage outlets that resort guests have access to include the Atlantis Cafe, Scoops Ice Cream and Candy, and Treasure Cove Waterfront Restaurant and Clam Bar. An Egyptian-style relic, made of modern material, that has been moving around Long Island for a hundred years. Inscription: "She who climbs to the Sphinx's head a millionaire will surely wed."